Amorphous Silicon Kazunobu Tanaka National Institute for Advanced Interdisciplinary Research, Ibaraki, Japan Eiichi Maruyama Hitachi Ltd, Ibaraki, Japan Toshikazu Shimada Hitachi Ltd, Ibaraki, Japan Hiroaki Okamoto Osaka University, Osaka, Japan Translated by Takeshi Sato, National Institute for Advanced Interdisciplinary Research, Ibaraki, Japan Amorphous silicon has substantially different properties as compared to crystalline silicon. It has therefore become recognized as a fascinating and important material in its own right, with many interesting facets that lead to a range of novel and still developing applications. Amorphous Silicon introduces the reader to this field by first discussing what is meant by the amorphous state. It details the way in which amorphous silicon is prepared, and the growth mechanism. The main structural, optical and electronic properties are then covered in detail, and there is a full chapter on the structural stability of the material, including photoinduced effects. Finally, a number of the most exciting applications of amorphous silicon are presented, including its use in solar cells, photo-sensors and liquid crystal displays. Amorphous Silicon will be of great interest to all those working in solid state physics or chemistry, materials science and electronic engineering, from postgraduate students to more experienced workers in these fields. 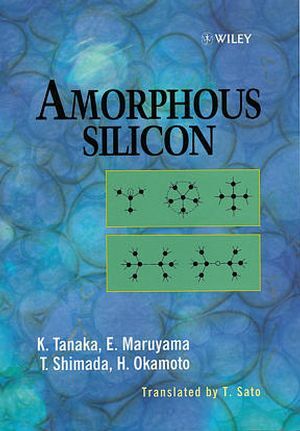 Kazunobu Tanaka is the author of Amorphous Silicon, published by Wiley. Methods of Preparation and Growth Processes. Structural Stability and Photo-Induced Effects.